However, customer acquisition is not an easy task. 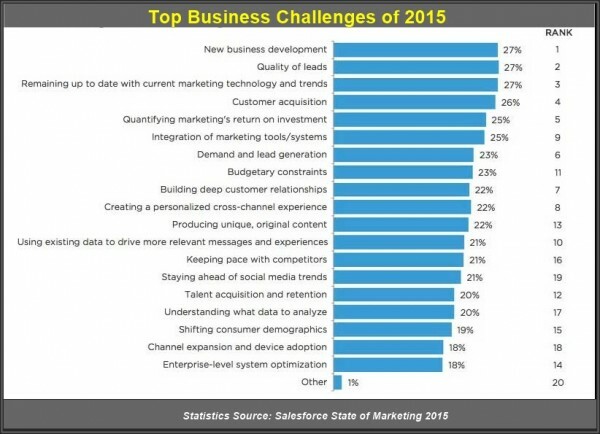 Salesforce State of Marketing 2015 confirms that majority of marketers believe customer acquisition and new business development as the biggest business challenge in 2015. Therefore, it requires building solid strategy to enhance customer relationships and avoid losing them. This is obviously a challenge and we’re here to help you meet that challenge effectively. Without setting proper goals, you won’t be able to measure the success level of your customer retention efforts. There are so many approaches to describe your goals. To guarantee success and buy-in within your business, develop your set of retention objectives around S.M.A.R.T (specific, measurable, achievable, realistic and timely). Consider sales figures from earlier years or months to set the objectives for a forthcoming time period. 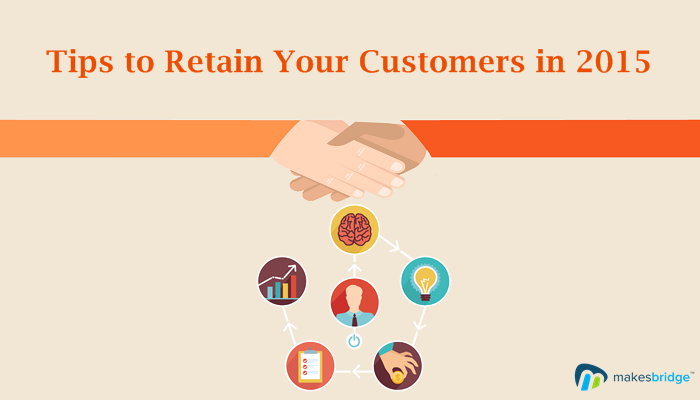 Customer retention is about engaging your current customer base. Ideally, you already have an abundance of analytical insights on who your clients are, the way they interact with your company and their buy products. This means, you must dig deeper and study your customer base. Learn; what are their demographics, what do they like/dislike, what can cause them to switch, and what do they like the most about you. People leave companies/products when their expectations are not met. The best marketing approach is to promise less and deliver more. Make sure that your staff keep customers informed if promises can’t be met. For example, in case of any delay or a technical fault has happened, ring up the customer on priority basis. One of the best ways to earn loyalty and address customers’ concerns is to enhance engagement with them. Use 24/7 customer support, social media, website, blog, and emails to get their feedback. Provide detailed information about how they can register their complaints and get the problems solved. Nothing can compensate frustration but something unexpected (good) can change the customers’ mood. For example a product’s shipment has delayed; you can offer a FREE coupon for a free delivery next time. This might add a little cost once but will retain a customer for life. Take your team’s feedback about bright ideas to delight your customers. Marketing automation can be one of your most effective tools for bringing clients back to you and make new purchases. Automate customer service; like, set auto-responders to avoid any complaint of delayed response. Use marketing analytics to track your prospects and create a refined list of hot prospects that may be interested in new products/announcements. Score your leads to distinguish them by level of interest. Use drip marketing to nurture leads Always use best practices for email marketing. Offer an extra value in the new messages/announcements to avoid being spammed. Strictly follow the best practices for email marketing success in 2015. Marketing automation works like 24/7 workforce and helps you manage your sales, marketing, and customer support in a cost-effective way. Modern customer is much informed than the customers in the past. We find customers using social media, blogs, forums, e-commerce portals, and official sites to learn about a product or even spread a negative feedback. This is a challenge from customer relations as well as business development perspective. A negative word of mouth can cause severe damage to the brand or business. Therefore, monitor your brand’s social media and online presence to track positive/negative word of mouth. Hire a digital strategist to monitor/manage your online presence. Use official blog/releases to help customers solve a problem. Ask support team to use social media (particularly Twitter) to respond immediately. Make it easy for customers to reach/find you on the internet. Provide contact/complaint information on every social profile. Our performances are always subject to improvement. All we need is to track the performance on a given standard or set of standards to set up new milestone. To do this, set your KPIs, check your engagement; sales and different figures to see how your efforts are working. When you watch a strategy that works well, you can use it to achieve more success in the future. However, if you feel that your efforts are falling flat, it is the right time to make a better choice. Remember, there are no failures in life; only lessons. A bad CRM story may be a terrible part of the history but we can make it a foundation stone. All you need is to learn from the mistakes and keep on improving.